Man oh man, I can't really say this is a "product design" or "usability" thing, but it's too good not to post. 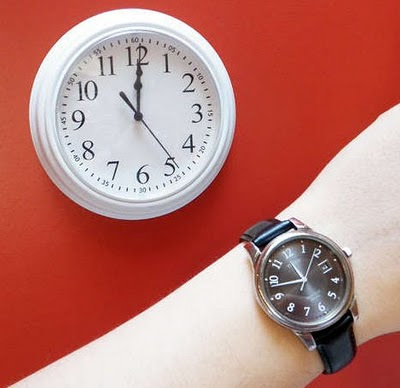 Randy Sarafan has a complete how-to guide at Instructables for making a clock that sneakily stretches out lunchtime, by speeding up 20% at 11am and slowing down 20% at 11:48am. That's an extra 12 minutes for your break - and who could argue with the clock on the wall? It's clever, subversive, and a worthy Arduino electronics project - so in that sense, well-designed! Bicyclists have to survive in a harrowing world: roads designed for and dominated by cars, against which they would lose in almost any accident. Designer Peter Miller realized that they need a way to notify bike-dangerous drivers of their behavior, and something better than shouting or dinging a little bell. His solution: the magnetic Yellow Card, which can be tossed by a biker onto the offending vehicle. 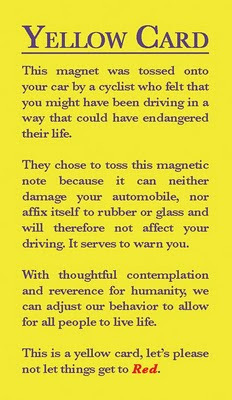 It's quite clever, since (as the card itself points out) "it can neither damage your automobile, nor affix itself to rubber or glass and will therefore not affect your driving." 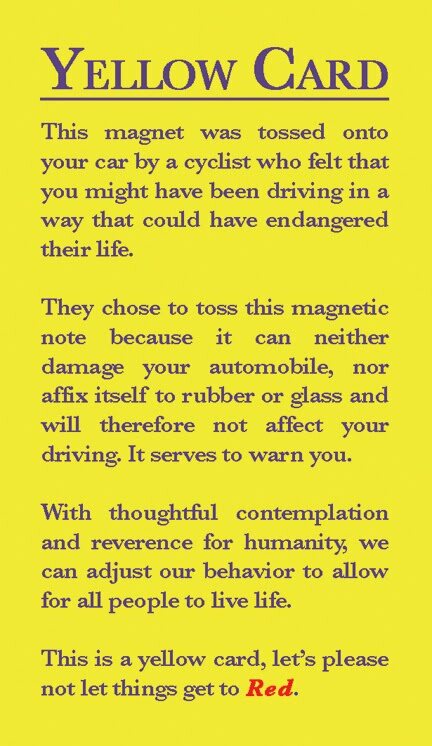 It would be a whole separate issue to study the actual reactions of drivers when they get around to reading these, though - perhaps they'd be more angry than apologetic when faced with these cards instead of a face-to-face confrontation. But the concept is certainly intriguing! I do love it when I get to blog about real, usable, actual buttons - and this one isn't just clever, it makes a lot of sense! Put the elevator button - or even just an additional elevator button - in kicking range. It may help to make the button stand out visually more than the one shown, but those with their hands full (or even those in wheelchairs?) will love it, as will germophobes! Cold winter weather gives us ample opportunity to ponder the wisdom of relying on capacitive touchscreens for every single function on our smartphones. The touchscreens, as you may have discovered yourself, can't be used with gloved hands (with the exception of expensive specialized gloves or a dog-made solution). So if you want to use your phone in the cold, but stick with the tools God gave ya, well, there's NoseDial. 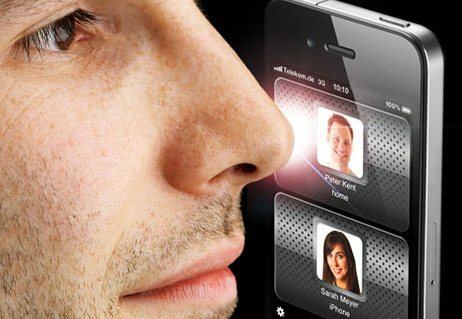 Your nose looks like a finger to the touchscreen, so it works - and the interface is designed to be usable at close range and with a big honker. Silly, definitely - but you may just find it useful! 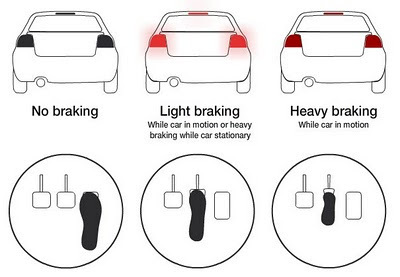 Sent my way by reader Mark Shervey, and designed by graphic designer Mark Cossey, here's a quick idea for progressive brake lights. (Hit the link to see the fully animated graphic, it makes a difference!) Light braking makes the lights behave as we're all used to, but heavier braking causes the brakelights to do a strobe-flashing thing to really get your attention. This makes good sense to anyone who's had someone stop extremely short in front of them - you definitely wish there'd been some warning other than the regular old brakelights! A strobe may not be the very best idea - epilepsy may be a problem - but some kind of progressive brakelight seems like a nice improvement on the norm. Get it made, Mark! 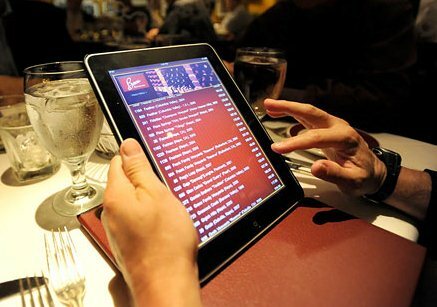 The New York Times and Gizmodo report that restaurants are starting to use iPads as wine menus - and what could be an obnoxious trendy publicity stunt is actually working out quite well. The reason cited is quick access to up-to-date, detailed, and objective third-party reviews. Since each individual wine carries quite a bit of supporting information (not just reviews, but descriptions, pairings, etc), even a modest wine list can't display it all on paper. So, bring in a tablet connected to any bit of info you could ever want, and the problem is solved: the diners research their options, feel more confident about a choice, and order more wine. R. O. I.
Google Laptop: Goodbye caps lock, hello search! Google recently released a laptop - well, kind of. It's "reference hardware" for its Chrome OS, to be tested and evaluated by the lucky ducks who get into the pilot program. 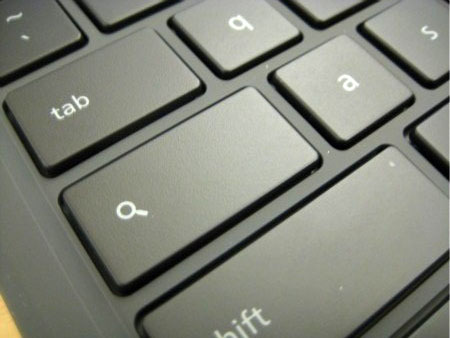 Among the many little design tweaks that make it different from your average netbook, one stands out as particularly relevant to the theme of this blog: the Caps Lock button has been replaced with a "Search" button. Sure, it's just a button - but around here, that means something! Google is saying (correctly, in my opinion) that caps lock is something we need less these days, and search is something we do more. Not only that, but this may be a nudge against those few people who still WRITE IN ALL CAPS - make it more difficult (like Apple did), and maybe it won't happen as often. In any case - capital or lower, ha ha - I like it.